Parakeet, aka Gable Parakeet, is a cute 3 year old red brindle female born October 3, 2007. Her sire is Gable Oscar, making her grandsire the late famous Gable Dodge, and her dam is Kelsos Snow Bird. 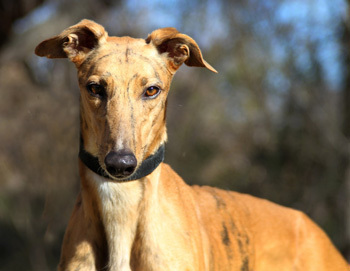 According to Greyhound-data.com, Parakeet's one race was on November 13, 2010, at Gulf Greyhound Park in LaMarque, Texas. So from there she was destined for finding her forever home! Her brindle markings, coupled with her white tuxedo throat, give her quite an exotic look. Parakeet is not cat tolerant but does well with small dogs. Well, hi there! My name is Parakeet but my foster mom and dad call me "Pari" for short. I love my new foster home with my new best greyhound friends, Hondo and Julie. They are very good about sharing their toys and beds with me - and Julie even lets me wear her best warm coat on chilly days. After just a few days, I learned all the house rules. I am learning to step carefully around Hondo and Julie when they are lounging on their dog beds, and I respond well to "no" when I do something wrong - like trying to take a toy away from Julie, or not waiting my turn for treats. Hondo and Julie have also showed me all of the best pee and poop places in the back yard, and I have had no problems at all with house training. Mom says that I have no bad habits; she thinks I am perfect AND cute as a button, especially when I shower her with my delicate kisses! I don't counter surf, but I do like to check my look in the mirror from time to time. (Refer to previous "cute" comment; how can I help myself? Have you seen those striking marks on my sweet brindle face?) I don't bark or growl or chew on anything except my toys - and I'm pretty gentle with them. (Love those squeakies!) Even though Julie and Hondo are allowed on the bed and sofa, I've never even tried to hop up on the furniture. Mom feeds me dry kibble in my crate; she's trying not to spoil me before I find my forever home. I have a healthy appetite and I'm not picky about my food. I do love the treats (various jerkies) that Mom gives me when I do my "business" in the back yard. Of course, I LOVE our daily walks to the park and other places in the neighborhood. Mom calls me her little "trotter" because I just bounce along the sidewalk. She also says I'm very good on the leash. I know how to respond to "wait" and "OK" - and I don't pull on the leash at all. I also love our rides in the car and settle in well in the back of the SUV. 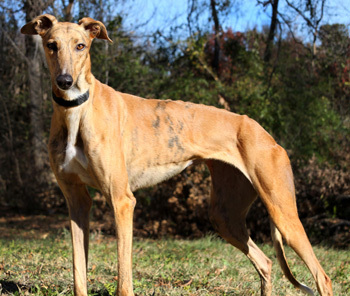 I'm just an affectionate, happy-go-lucky girl who loves her humans and greyhound foster sibs. Mom has left me home for several hours in my crate and I'm perfectly happy since Hondo and Julie are always nearby. She plans to leave me all by myself for a few hours in the next few days, so she can see if I will be OK as an "only dog." I'm pretty adaptable, so I'm thinking I'll probably still be OK. I'm one happy camper! But I'll be even happier when I find my forever home. Do YOU have enough room in your heart to let me crawl inside of it? I've got so much love to give - from the tip of my nose to the gorgeous white tip of my tail -- and I'm waiting for someone just like YOU!